Run your bar or restaurant efficiently. New orders and updates can be wirelessly sent to the kitchen or bar as soon as you encode them. The order instructions are automatically sent to the correct printer based on the menu item category. Orders can be paid in separate payments, or split into multiple new orders. Split orders can be paid immediately, or kept for later. Spend less time at the counter, be there for your customers. With the floors & tables manager. Odoo Restaurant lets you quickly overview your restaurant and jump from floor to floor to your table's orders. The floor plan will tell you exactly where are your customers, where are the free tables, who is still waiting for food, how much room do you have left. 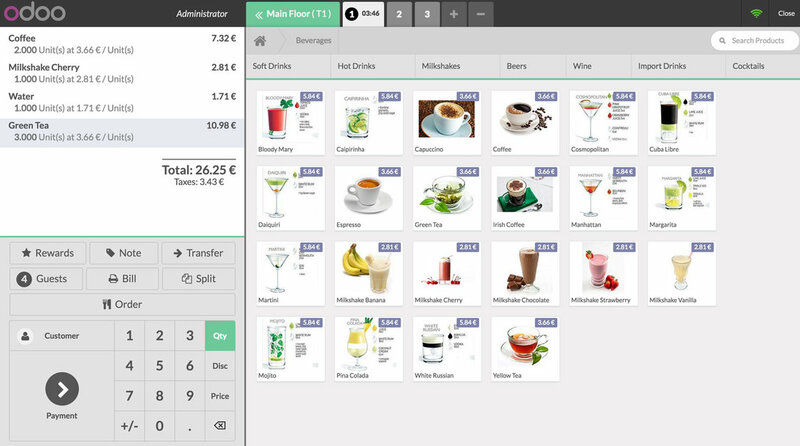 As a Web Application, Odoo Restaurant does not require any installation. It just works online. While an Internet connection is required to start the Point of Sale, it will stay operational even after complete disconnection. Give your clients a positive experience by improving your services. Offer loyalty cards and rewards, get a quick overview on available tables, control sales and cash in real time, record clients to inform them, etc.. The largest baking and party supplies specialty shop in Finland. As the company grew, Confetti was looking for an ERP solution to support e-commerce business processes. A wine bar implemented Odoo Online two years ago. From Inventory to Point of Sales, discover how they are managing and selling their wines.